Nats Or Reds? Who Would You Rather Face? – The Lunatic Fringe The Lunatic Fringe | Nats Or Reds? Who Would You Rather Face? So who would you rather face? The Nationals are the team that’s stumbling. Since sitting Strasburg, they haven’t been able to win as consistently as they had the beginning of the year. On the other hand, the rotation wasn’t just Strasburg. Gio Gonzalez and Jordan Zimmerman have been having career years. Ross Detwiler and Edwin Jackson have been moved up in a playoff rotation, but in a short series that isn’t as important. Stumbling or not, the Nationals also have a potent offense, although none has been overwhelming on their own. Ryan Zimmerman, Ian Desmond and Adam LaRoche supply a dizzying amount of power, and while Bryce Harper isn’t exactly Mike Trout, he demands a lot of attention. And Jayson Werth does have the potential to break out…though he also has the potential to do what Pat Burrell did in the playoffs. Meanwhile, the stereotypical Reds are no longer a pitching-weak and hitting-strong team. Johnny Cueto has been every bit the ace that Gonzalez has, and while the rest of the rotation hasn’t had a strong #2 the way Zimmerman has been in Washington, Mat Latos, Bronson Arroyo and recent no-hitter-thrower Homer Bailey are a deep rotation. Add to it that Cincinnati’s bullpen has been the best in the league, including one of the most intimidating closers in baseball Aroldis Chapman. However, when it comes to hitting, the Reds are no longer the Machine they were. Joey Votto is one of the league’s best hitters, but he home run power has dropped. There’s some power in Jay Bruce and Ryan Ludwick, but they aren’t as consistent hitters. There are other hitters, like Brandon Phillips and the talented Drew Stubbs, but all have had flaws and consistency issues. This is a lineup that can slump against a good set of pitchers. There’s not really a clearcut ‘better’ team for the Giants to face. Both teams are dangerous, neither have obvious weaknesses, and both of them got a lot of wins against the Giants this season. Either one will be difficult to win a series against. So, what does it come down to, for me, as far as who I want to face? 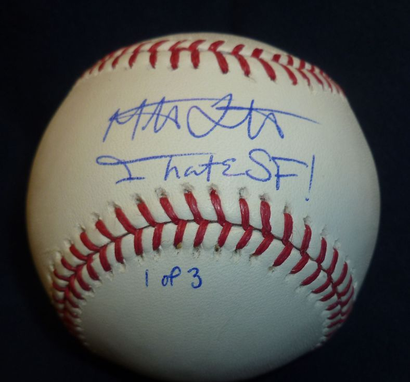 That’s a Mat Latos signature from when he was with the San Diego Padres. Seriously, screw that guy. I’d love for the Giants to be the team who ends his playoff hopes. Give him a real reason to hate the Giants. Do it to beat Mat.